According to the City of Chicago's official website, buildings are 'the number one source of greenhouse gas emissions in Chicago.' This may be surprising given the heavy vehicle traffic and public transport system in the Chicagoland area. However, green buildings are a primary component of Chicago's efforts to become more green and sustainable in the twenty-first century. Green buildings have the potential to reduce greenhouse-gas emissions and waste, while reducing overall use of energy and other resources. All U.S. cities are currently at least somewhat vulnerable because of climate change and dependence on fossil-fuel sources. If there were to be a dramatic change in climate, or a significant reduction in the availability of fossil fuels, most cities would be vulnerable and may be unable to function as normal. Newman indicates that a resilient city is one that is entirely or predominantly free of dependency on fossil-fuel sources. Newman suggests that cities with 80 t0 100 percent “fuel security” are those which are sufficiently resilient to cope with climate or fuel-availability changes in future. Chicago is a transport hub in the Midwest of the United States, which contributes both to its security and its insecurity were fossil-fuel availability to change in the future. The geography of the area can be seen as part of its resilience – unlike, say, New York City, Chicago is not near the ocean and therefore is less vulnerable to significant flooding than other comparable coastal cities. However, Chicago's transport system and logistics networks are tied to rail and road networks, which are of course vulnerable to changes in fossil-fuel availability for as long as trains, buses and cars run predominantly on fossil fuel. Newman defines a resilient city as one that is 'sustainable in its economy, environment, and community... it has a deeper quality which enables it to quickly adapt to challenges and rebuild itself for any challenge it faces.' Newman advocates for dense, compact development of land as one way to increase the resilience of a city. 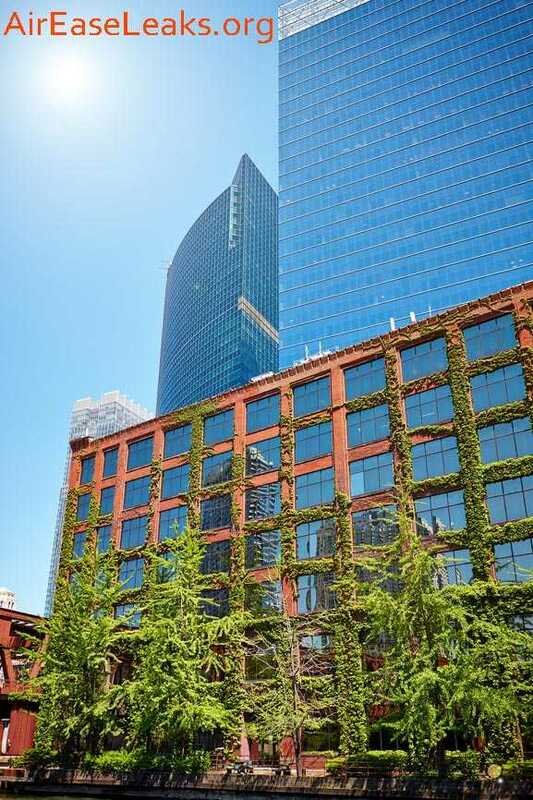 Chicago's green buildings increase the city's resilience in several ways. Energy use is reduced in green buildings through factors such as the installation of solar-power panels on building roofs, or the planting of trees and grass on, in or around buildings. Green buildings that do not need fossil fuel for energy greatly increase overall resilience, as they can function regardless of the availability or price of fossil fuel in the future. Those buildings that use fossil fuels can nonetheless contribute to resilience through greater efficiency in heating and cooling – simple factors such as efficiency of green-building insulation can decrease energy use and therefore increase resilience. Water use and dependency is a significant factor in determining a city's resilience or otherwise. Water efficiency factors are included in the “Chicago Standard” for green building construction and retrofitting. The Chicago Standard is a list of 46 practices for green building and building use, adapted from LEED recommendations. These standards include a 20% water use reduction target, and the adoption of specific strategies to increase water efficiency as far as is possible in the context. Ultra-low flow fixtures (such as toilets) are a key component of water efficiency standards in Chicago at the present time. The standards also recommend re-use of water from storms, rain, and from “graywater” sources for flushing toilets and urinals. At present, a significant portion of the average American's daily water usage is for flushing such fixtures; using treated drinking water for this purpose is not very green or efficient. Building projects that meet water-efficiency and other green standards are eligible to apply through the Green Permit Process. This is an incentive for builders because the permitting process is faster, and the permitting fees may be reduced by comparison to non-green permits. If green water-efficiency technologies are included in the building project, the permitting can only be done through the Green Permit program. Commercial buildings must meet the standards and requirements of the established LEED system for water efficiency and other green building factors. Residential, private homes are certified through the Chicago Green Homes program, also based on LEED standards for homes. These incentives promote water efficiency both private homes and in businesses. In the City of Chicago, water-efficiency measures greatly improve the overall efficiency of buildings and neighborhoods. Particularly when development is high-density and compact – for example, in Chicago's famous skyscraper buildings – water efficiency can be maximized in a compact fashion. Increasing residential and commercial water efficiency has positive effects in the city and the greater region, as water pollution is decreased and less water is drawn from streams, rivers and Lake Michigan for treatment and drinking-water use. Regional water therefore becomes more plentiful, and cleaner through efficiency measures in green buildings. City of Chicago. Green Permit Program. City of Chicago. The Chicago Standard. Tinley Park, IL. The Local Energy Development Report. Kibert, C. J. Sustainable Construction: Green Building Design and Delivery. Miller, N., Spivey, J., & Florance, A. Does green pay off?. Journal of Real Estate Portfolio Management. Newman, P. Interview. American Society of Landscape Architects.